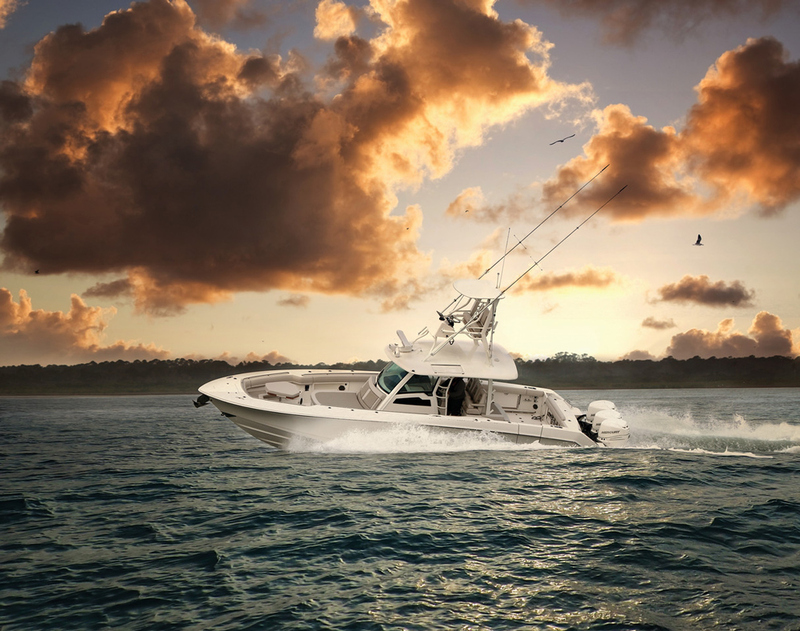 If you’re in the market for a hot new fishing boat, check out these top 10 picks. 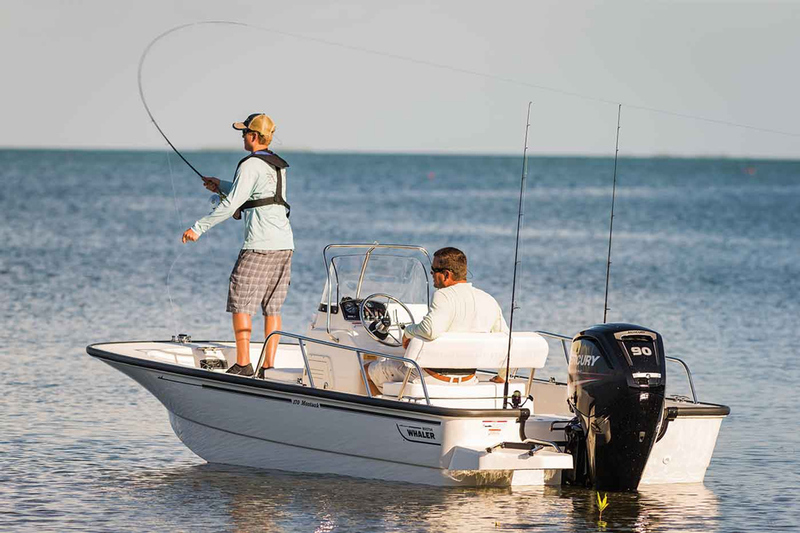 Whether you’re a fan of center consoles or bay boats, aluminum fishing boats or bass boats, one thing is for sure: as you look back at the model year, choosing the best fishing boats of 2018 is no easy task. We saw hot new fishing machines of all shapes, sizes, and designs, and it’s never a simple thing to whittle down all of those models to a list of 10. But we know you boaters want the cream of the crop, so choose we must. Here they are for 2018—our picks of the 10 best fishing boats to hit the water—and don't forget to check out last year's models. 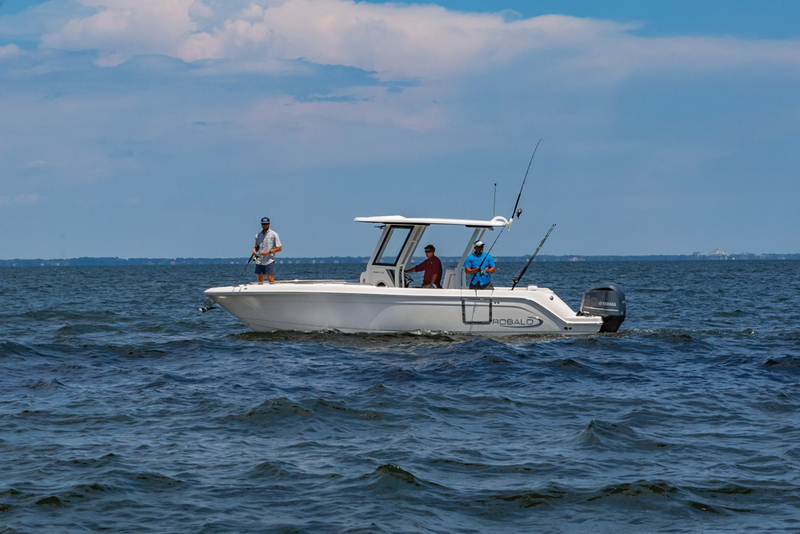 Setting aside our earlier comments about how tough it is to choose the best in an incredibly strong field, picking the Boston Whaler 170 Montauk was actually something of a no-brainer. That’s because when we spent a day aboard this new model we recognized that it’s been refined and improved over the old-style Montauks to a huge degree. 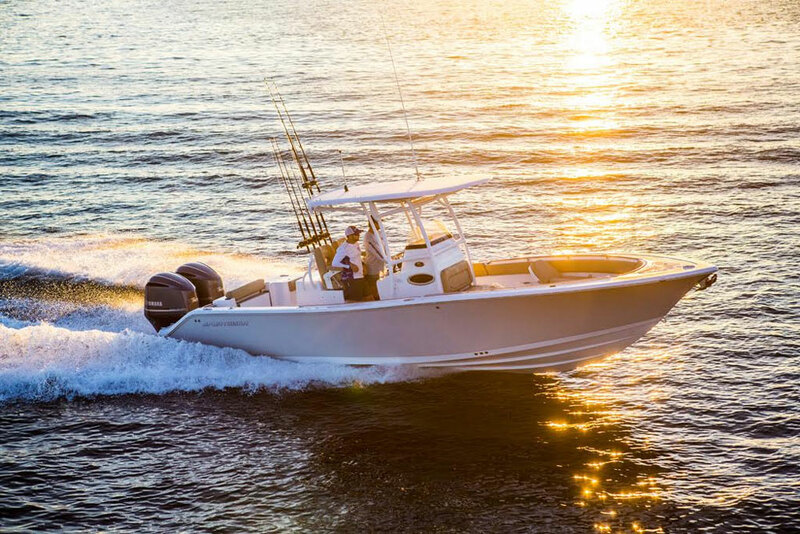 Highlights include a flip-back helm seat that houses a livewell, a forward fishbox that’s thoroughly insulated and has a hatch (fully finished on both sides) that raises on a gas-assist strut, four aft rodholders, and jump seats at the stern. Added bonus: like all Whalers, the 170 Montauk is built with a glass-foam-glass sandwich construction that creates a completely unsinkable boat. 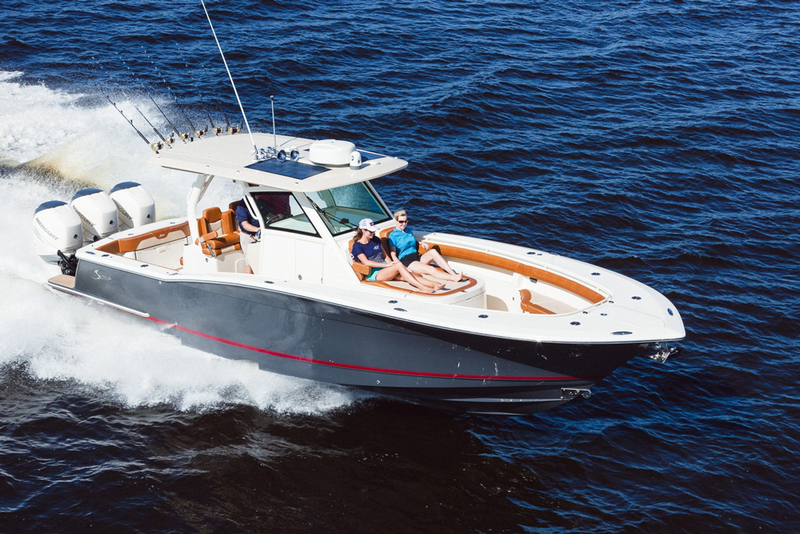 See our Boston Whaler Montauk Video Boat Review, or browse some 170 Montauk listings. This year Ranger introduced the VX series of deep-V aluminum fishing boats, with four models in 18’2” and 18’11” lengths. Truth be told we might have picked any of the four, as these boats all offer big-water capabilities for a light, economical rig, as well as long standard features lists including items like livewells, rodboxes, electronics, electric trolling motors, onboard battery chargers, and even standard trailers. We’re also impressed by the hefty 0.125” aluminum hull thickness. But we give the final nod to the VX1888 WT in specific because it has a tall, broad, protective wrap-around windshield that you’ll surely appreciate when the seas kick up and the spray starts flying. 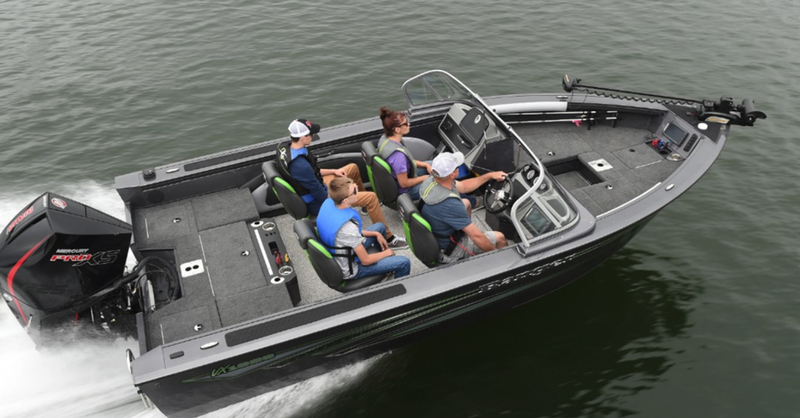 Tracker came out with a 40th Anniversary Edition of the Pro Team 195 TXW, a semi-V aluminum bass boat that comes with a trailer and a 150 HP outboard at a very reasonable $27,295. What really grabbed us was the inclusion of so many options that would usually add gobs of cost to the bottom line. 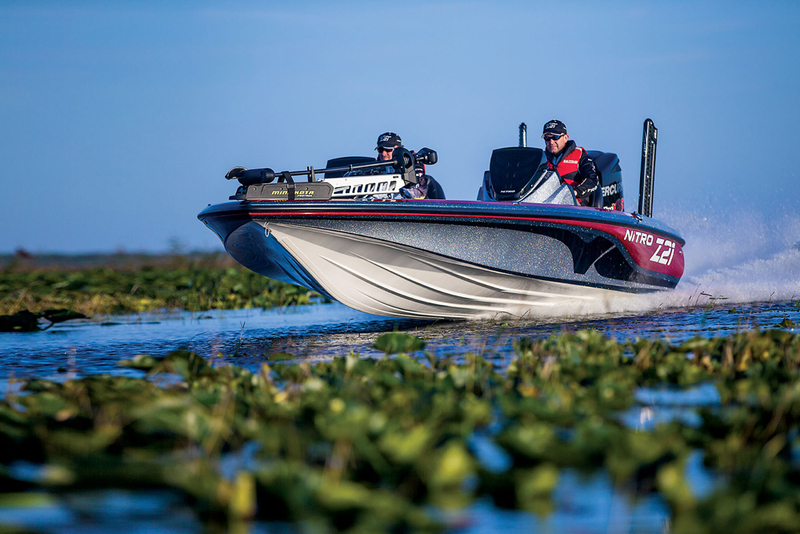 Along with the big-ticket items already mentioned, the 40th Anniversary Edition comes with not one but two Lowrance Hook-5 fishfinders, an upgraded 24-V 70-pound thrust electric trolling motor, an upgraded onboard battery charger, and more. 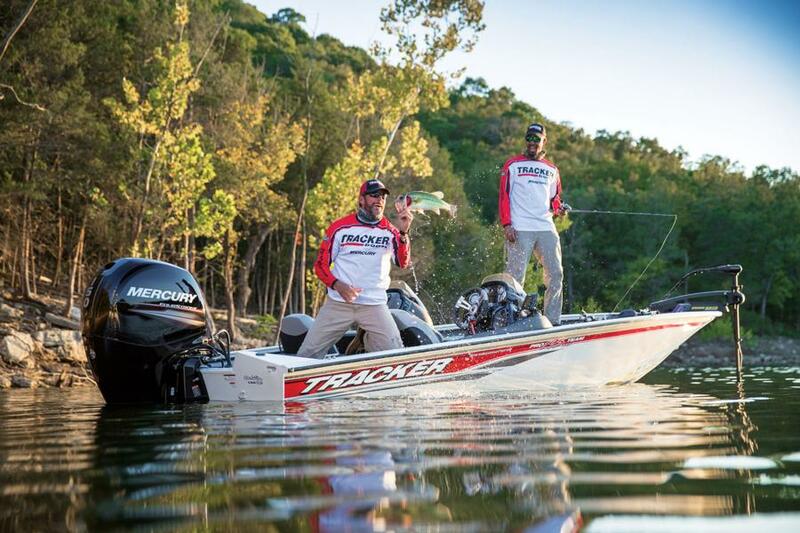 See Tracker Pro Team 195 TXW listings. Sportsman Boast redesigned several of their Masters series for 2018, and one we particularly like is the 207. With an all new deck design it has increased space in the cockpit, a new bow seating and stowage arrangement, and a centered flip-up bench seat built into the aft casting deck. And despite its small size, the 207 Masters has three livewells, two 20 gallon wells in the aft deck plus a 10 gallon well up forward. Plus, with a Yamaha F115 you can expect a cruise in the upper 20s and a top-end approaching 40 MPH. See Sportsman 207 Masters listings. 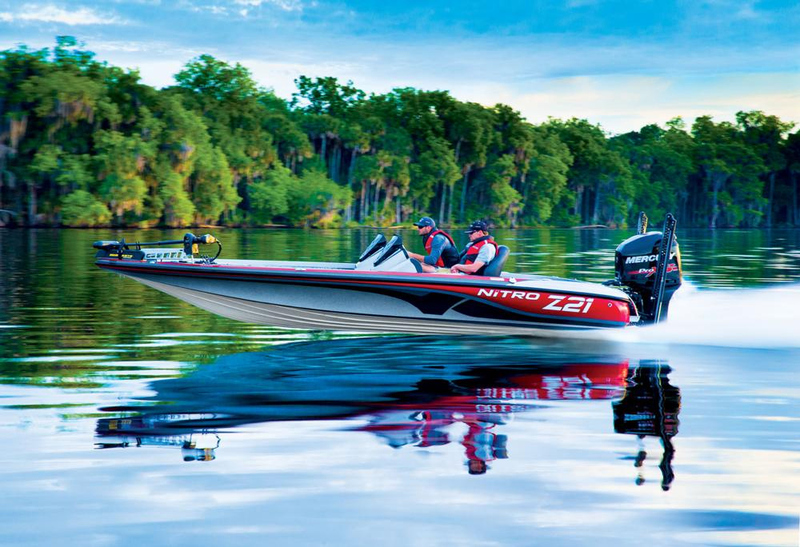 The Nitro Z21 was one of the boats that made out list of Best Bass Boats, and the Z-Pro version takes it a step farther by including a slew of upgrades to the standard equipment. 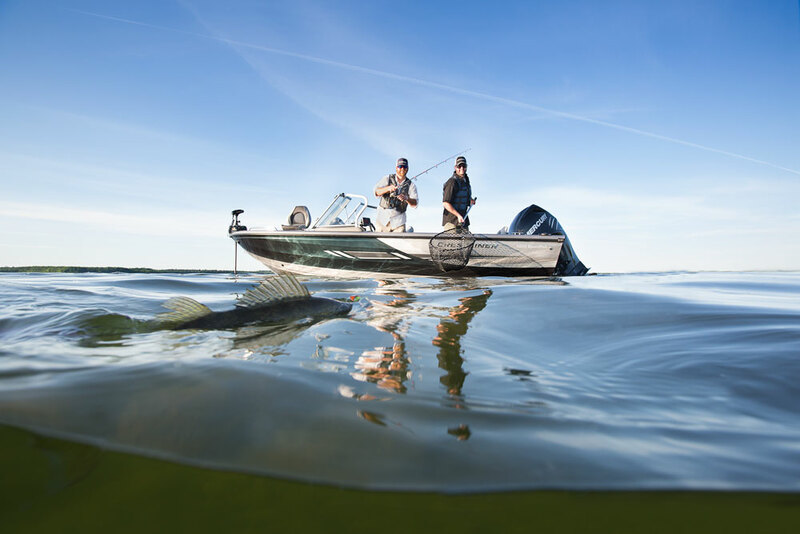 The electric trolling motor is beefed up from a 24-volt, 80-pound thrust model to a 112-pound thrust Minn Kota Forterx. An Elite-7 Ti fishfinder/chartplotter gets boosted to an Elite-9 and an Elite-12. And not one but two Power Pole 8 Blade Edition shallow water anchors are also in the mix. On top of those upgrades the standard motor is a 225 HP Optimax Pro which provides a top-end in the 66 to 68 MPH range – and you can upgrade to a 250 or 300 HP engine, if you want to hit speeds in the 70s. One look at the Robalo R272 and you know that you’re looking at a brand new model, because we haven’t seen the likes of this from Robalo before – and we like it. We should point out that this is actually a 2019 model, but we spied it last October as it made the rounds at the fall boat shows. So, what makes this boat stand out from the pack? For starters a huge hard top which Robalo says is the biggest in the class. Second, a smart combination of comfort and fishability. The aft-facing seat in the back of the leaning post is an excellent example; the seat bottom flips up and folds away, to expose a livewell. Another slick trick is the gunwale door, which swings open and stays put on a magnetic catch in the inwale. Robalo has a history of striking a nice balance between family-friendly and fishing, and they’ve done it again with this model. Scout’s 355 LXF makes our list because it’s one tricked-out tech machine that takes advantage of the latest and greatest of, well, just about everything. For starters, it’s one of the smallest boats around to have a dedicated Seakeeper gyro-stabilization system designed in. Secondly, it’s wired for CZone digital switching and all of the boat’s systems can be controlled with a finger-swipe on the LCD screen at the helm. 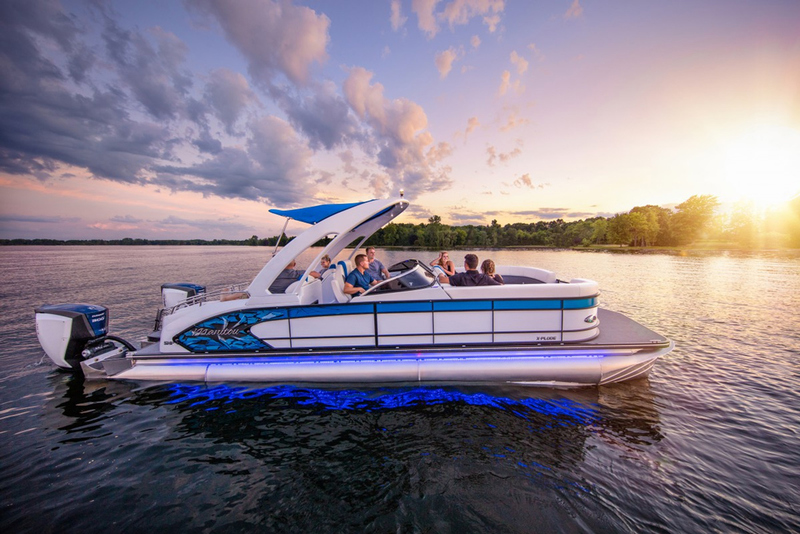 Third, it has all the latest design features found in cutting-edge center consoles, like a big lounger built into the front of the console, triple-wide helm seating, and a fully integrated windshield and hard top. And finally, the 355 LXF runs on a twin-stepped hull that delivers an eye-watering 47.9 MPH cruising speed (with triple 300 HP outboards) and a top-end of 62.6 MPH. See our Scout 355 LXF Review, or browse some Scout 355 LXF listings. 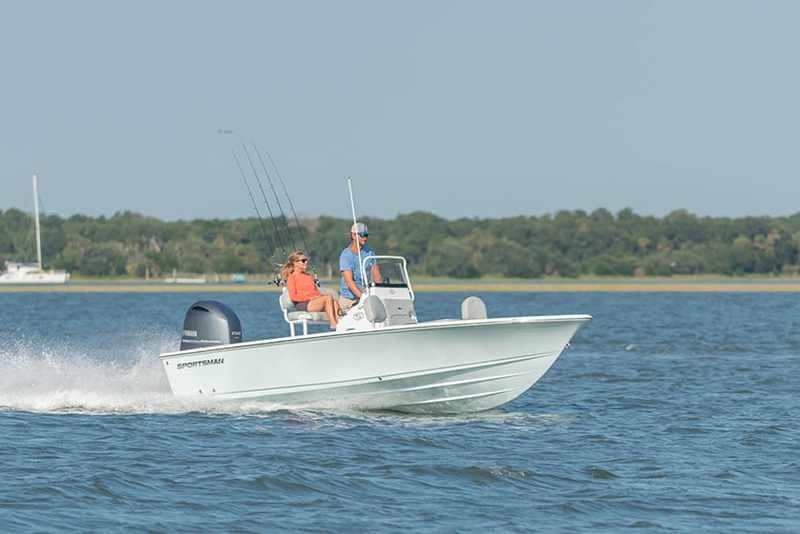 We liked the Mako 414 CC when it was introduced last year, and when they followed it up with the 414 CC Sportfish Edition, it was love at first sight. 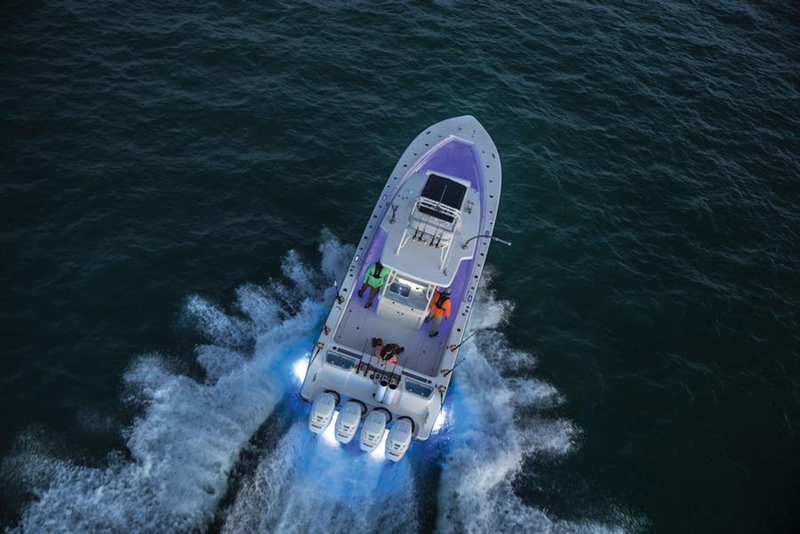 Unlike so many big center consoles of this size that incorporate things like huge cabins and outdoor grills—to the detriment of the boat’s fishability—this Mako is built to slay pelagics, period. Minimizing the console cabin opens up acres of deck space, instead of poofy seats behind the leaning post you have a massive tackle station, and the fishboxes are sized for wahoo, not white perch. 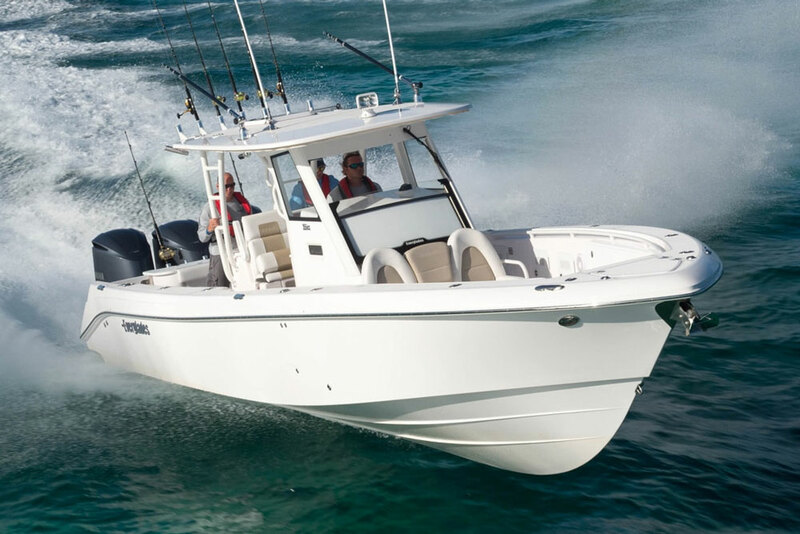 Read our Mako 414 CC Review, or browse Mako 414 CC Sportfish Edition listings. The Grady-White Canyon 456 is the biggest Grady-White ever built, and we think it might just be the best boat Grady’s ever built, too. 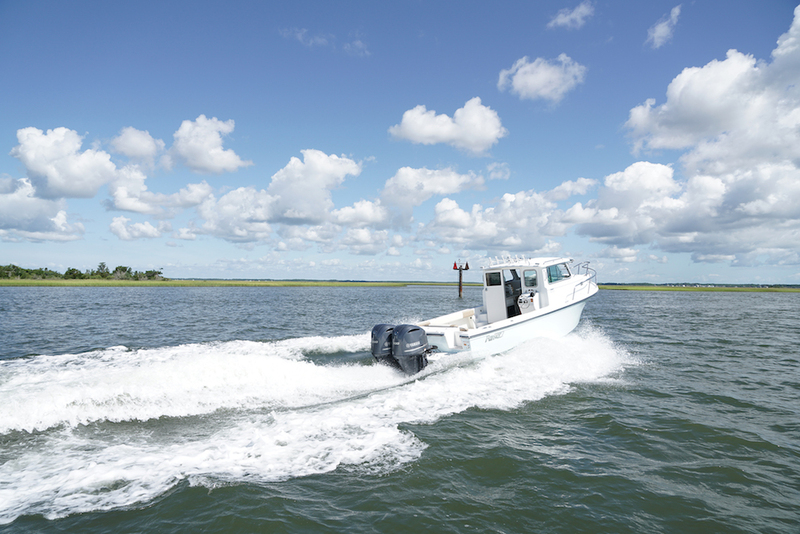 Whether you choose to get quadruple Yamaha F425 XTO Offshore outboards on the transom or you opt for quad F350C outboards, the boat carries an impressive amount of power and performs like a sport-boat with cruising speeds of well over 30 mph (over 40, with the 425s) and a top-end in excess of 50 mph. 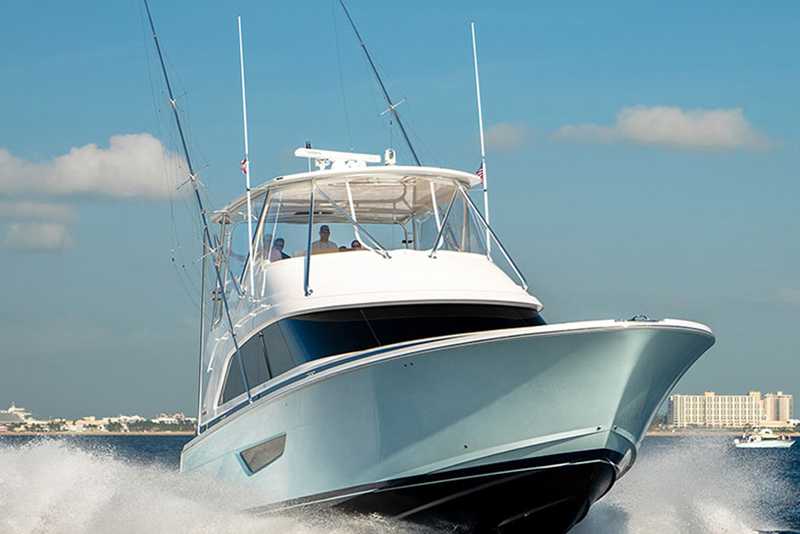 As far as fishing goes this boat has an utterly massive cockpit equipped with everything from twin 35-gallon livewells to a 459-quart fishbox with integrated freezer coils and a digitally-controlled thermostat. And as far as the cabin console goes, it’s more yacht-like than boat-like in every regard. It has a dinette that converts into a berth, a fully-enclosed stand-up head with a separate shower stall, a full galley, a teak sole, and 12,000 chilly Btus of air-conditioning. Did we mention that the A.C. is even plumbed into the cockpit, so you can enjoy a cool breeze on sweltering-hot summer afternoons? And that a Seakeeper gyro-stabilization system ends rocking and rolling? This one will be tough to top, people—very tough to top. See our full Grady-White Canyon 456 Review, or browse Grady-White Canyon 456 listings. When it comes to big convertibles, none turned heads this year so much as the introduction of an all-new Bertram 61. Spend some time aboard and the first thing you’ll notice is that the boat is built like the Bertram reputation demands: heavy-duty hardware, doors that close with a “thunk” instead of a rattle, and a vinylester resin infused hull. Where Bertram went off the reservation and became seriously innovative, however, is on the flybridge. 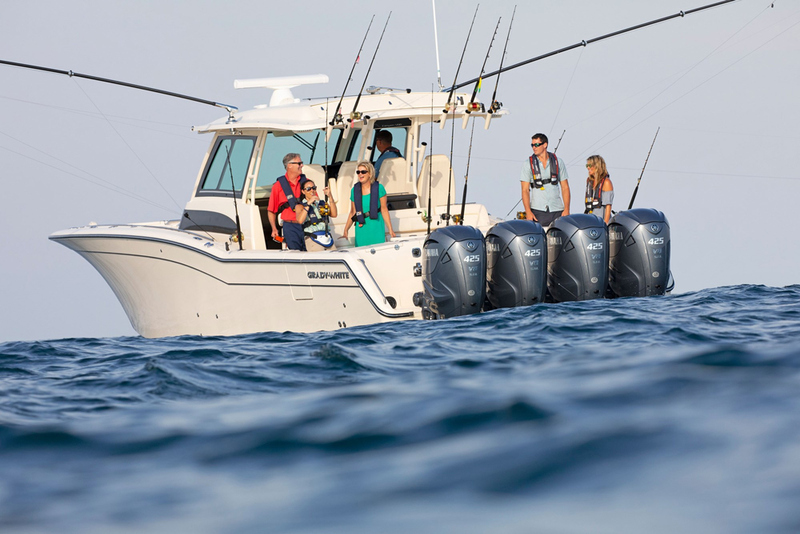 A unique lounger in front of the console and flanking side lounges with reversable backrests creates comfy seating for a half-dozen people when running, and when you put out the trolling lines, a pair of sharp-sighted anglers can sit facing aft to watch the baits.